Cesarean-derived piglets were reared for 5 wk under germfree conditions or monoassociated with a benign Escherichia coli (G58-1) or a enterohemorrhagic strain (933D) derived from O157:H7, and immunized i.p. with the T-dependent (TD) Ags fluorescein-labeled (FL) keyhole limpet hemocyanin or trinitrophenylated (TNP) keyhole limpet hemocyanin and the type 2 T-independent Ags TNP-Ficoll or FL-Ficoll. Only colonized piglets showed an increase in serum IgG, IgA, and IgM and had serum Abs to FL, TNP, and colonizing bacteria. While serum Abs to FL or TNP appeared following colonization alone, secondary responses were restricted to piglets immunized using TD carriers. While animals colonized with 933D had significantly higher total serum IgG and IgM levels and specific IgG Abs than those colonized with G58-1, no differences were seen in serum IgA levels, B cell diversification in the ileal Peyer’s patches, and specific activity (ELISA activity per micrograms of Ig) of pre-boost serum IgG and IgM anti-TNP and anti-FL Abs. Serum IgA Abs to TNP, FL, or bacteria were not detected. Ag-driven responses, as measured by an increase in specific Ab activity, were only observed in secondary responses to TD Ags and to colonizing, pathogenic E. coli. We propose that germline-encoded, isotype-switched B cells in newborn piglets differentiate to Ab-secreting cells 1) after stimulation by bacteria-activated APCs or 2) through direct stimulation by bacterial products. We further propose that Ag-driven systemic responses require both bacterial colonization and TD Ags translocated to the peritoneum. It is generally accepted that the microbial flora that colonizes the gastrointestinal tract of the newborn influences the immune response of the neonate (1). Historic studies in rodents have shown that colonization significantly increases serum γ-globulin levels (2, 3) and immunoresponsiveness (4, 5). Similar effects of colonization are seen in isolator piglets (6, 7). Such an effect is not surprising, since ∼500, mostly anaerobic species of bacteria of 28 genera colonize the gut during the first few days of life (8, 9, 10). In pigs, concentrations up to 109 bacteria/g of ileum and 1011 bacteria/g of colon occur (8, 11, 12). In addition to gut bacteria, the gut mucosa contains half the lymphocytes in the body (13), so colonization would be expected to especially impact the mucosal immune system. Our studies on Ab repertoire development in piglets colonized with a 13-species “exclusion flora” cocktail support this prediction (6). Colonizing bacteria provide a variety of immunogenic substances that fit into distinct categories. Bacterial proteins require recognition and processing by B cells, macrophages, or dendritic cells followed by subsequent peptide presentation to Th cells. These are called T-dependent (TD)3 Ags. Other immunogens, such as peptidoglycans and cell wall polysaccharides, present multiple repeating epitopes that are also recognized by the B cell receptor (BCR), are less dependent on T cell help for Ab secretion, and are called type 2 T-independent Ags (TI-2). A well-accepted experimental model for TI-2 Ags is Ficoll (Amersham Pharmacia Biotech, Piscataway, NJ) that has been heavily substituted with a hapten. While peptidoglycans may simply act as TI-2 immunogens for B cells they are also agonists for Toll-like receptor-2 (TLR-2) on dendritic cells/macrophages (14). Muramyl dipeptide, derived from peptidoglycans, displays adjuvant properties for macrophages (15, 16, 17). While substituted Ficoll and various TI-2 bacterial carbohydrate Ags stimulate the immune response solely through BCR recognition, LPS from Gram-negative bacteria can stimulate B cells and other cells through TLRs (18, 19). Since stimulation by LPS is also independent of T cells and the BCR, it is classified as a TI-1 Ag. The established paradigm is that naive B cells can respond to TI-1, but not TI-2, Ags although LPS (TI-1) can synergize with BCR cross-linkers to allow them to proliferate (20). In mice sIgM+ sIgD+, but not naive IgM+ IgD−, cells respond to both TI-2 and TD Ags, while both phenotypes of B cells respond to LPS (21). This categorization of Ags may be oversimplified, since both TI-1 and TI-2 Ags can cause proliferation of 33% of normal murine neonatal B cells (22), and T dependence appears quantitative rather than absolute (23). LPS and peptidoglycan are not the only bacterial products that can stimulate the immune system by T cell-independent mechanisms. Nonmethylated bacterial DNA displaying certain sequence motifs (CpG oligodeoxynucleotides) also stimulate Ab responses without BCR recognition (24). The immune system of the neonatal piglet differs from that of rodents in part because of a major difference in the mechanism of passive immunity and because of the precosial nature of the newborn piglet. Piglets receive virtually no passive Abs in utero as do rodents (25, 26, 27) and are therefore free at birth from maternal immunological factors or from environmental Ags that may be transported in utero as immune complexes. Thus, studies on newborn piglets come closer to zero with regard to the potential effects of environmental and maternal influences. However, the intrinsically developed immune system of the fetal piglet appears precosial by comparison with that of the fetal mouse. In piglets, terminal deoxynucleotide transferase activity is present at the onset of VDJ rearrangement (28), and switch recombination is an in utero event (27, 29). The Ab repertoire in all major isotypes is polyclonal at birth (29) and therefore seemingly capable of recognizing many environmental Ags. The studies we report here were designed to test whether precosial newborn piglet can respond to TD and TI-2 Ags, i.e., those that stimulate through the BCR. Our results indicate that encounter with intestinal bacteria is needed before the B cells of newborn piglets can produce Abs that recognize epitopes on TD and TI-2 Ags, but 1) immunization with the TD and TI-2 Ags is not required; 2) the amount, but not the specific activity, of such Abs depends on the nature of the colonizing bacteria; and 3) Ag-driven responses are only observed during secondary response to TD Ags and pathogenic bacteria. Furthermore, we show that colonization results in a substantial increase in the activity of follicles of the ileal Peyer’s patches and raises serum IgA levels, but the magnitude of these effects is independent of the nature of the colonizing bacteria. Piglets were recovered by closed hysterectomy from 110-day gravid outbred swine, placed in pairs in germfree (GF), rigid tub isolators and reared on ESPLac (Pet AG, Hampshire, IL) as previously described (6, 30). The colonization, immunization, and sample collection regiment was conducted as diagrammed in Fig. 1⇓. The three colonization groups were those 1) inoculated 24 h after recovery with 109 strain G58-1 Escherichia coli (designated G58-1 IM), 2) inoculated with the same dosage of enterohemorrhagic E. coli strain 933D derived from O157:H7 (31) (designated 933D IM), and 3) maintained GF. Animals in these three groups and those in a pilot study (Fig. 2⇓A) received 3 mg of fluorescein-labeled keyhole limpet hemocyanin (FL-KLH) and 3 mg trinitrophenylated Ficoll (TNP-Ficoll) i.p. on day 3 and again 4 wk after cesarean recovery. The fourth and fifth groups were colonized with G58-1 and 933D, respectively, but were not immunized (designated G58-1 and 933D without the IM suffix). In a second study GF piglets were given 19 mg of TNP-Ficoll plus 19 mg of FL-KLH i.p. In a third study treatment groups were colonized with G58-1 or 933D, but were immunized with TNP-KLH and FL-Ficoll to test whether our initial findings were epitope or carrier specific. Experimental design for colonization and immunization studies with isolator piglets. Five treatment groups of four to eight animals each were used. One group was maintained GF and immunized, a second was colonized with E. coli G58-1 and immunized, and a third was colonized with E. coli 933D and immunized. Two additional groups were colonized with G58-1 and 933D, respectively, but never immunized. All piglets were immunized and boosted at the times indicated with 3 mg each of TNP-Ficoll and fluorescyl-KLH or with the carrier-hapten combination reversed. 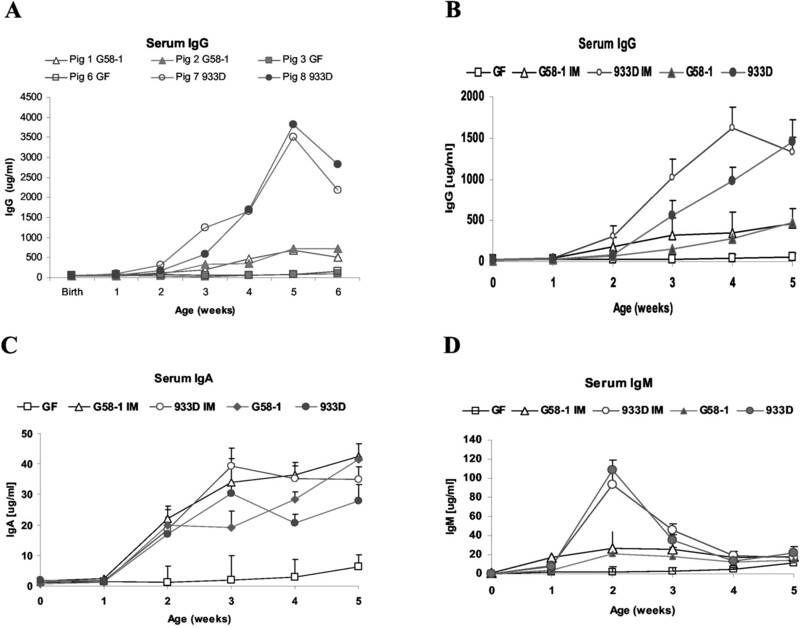 Serum Ig levels in colonized and germfree piglets. A, Data for individual animals in different treatment groups. B–D, Data expressed as the mean and SE of four to eight animals per treatment group. The treatment groups are those described in Materials and Methods and in Fig. 1⇑. The suffix -IM designates immunized piglets. Weekly blood samples were collected from the time of birth. At the age of 5 wk randomly selected animals from each group were euthanized by approved electrocution, and a broad spectrum of tissues was collected for preparation of RNA, immunohistochemistry, and bacterial culture. The use of a minimum of four animals per group was based on pilot studies that indicated minimal within-group variation (Fig. 2⇑A). All animals were monitored weekly for contamination. Data on Ig and TCR transcripts recovered in this study will be reported elsewhere. KLH (150 mg; Sigma-Aldrich, St. Louis, MO) was dialyzed overnight against sterile 0.1 M K2CO3 buffer, pH 10.5, to which 50 mg of FITC (Sigma-Aldrich) was added. After 36-h incubation at 37°C the mixture was sterile-filtered (0.22 μm pore size; Millipore, Bedford, MA) and dialyzed for 3 days against multiple changes of sterile 0.01 M TBS. Aminoethyl carboxymethyl-Ficoll was prepared as described by Inman (32). Five hundred milligrams of aminoethyl carboxymethyl-Ficoll was solubilized in 40 ml of sterile 0.15 M K2CO3 to which 2.5 ml (250 mg) of picrylsulfonic acid was added. After incubation at 37 for 48 h, the product was sterile-filtered (0.22 μm pore size; Millipore) and then dialyzed against 0.01 M sterile TBS. The concentration of the resulting TNP-Ficoll was determined by weight of Ficoll. The final product was sterile filtered into 6-mg aliquots; this corresponded to the amount needed for immunization (or boosting) of two piglets in the same isolator. The FL-KLH was packaged in the same manner following sterile filtration and determination of total KLH concentration by Lowry’s method (33). Fluorescein does not interfere with the Lowry assay (34). The sterility of all immunogens was tested before use by inoculation on blood agar plates. Similar methods were used to prepare TNP-KLH and FL-Ficoll. Blood samples were collected in heparinized Vacutainer tubes and processed to recover both plasma and the leukocyte fraction. Briefly, the blood was centrifuged at 1400 × g for 10 min at 4°C, and the plasma was carefully removed. The buffy coat was then transferred to a 50-cc tube filled with ammonium chloride/potassium solution and incubated for 10 min to lyse the erythrocytes. The leukocytes were then pelleted, washed, and resuspended for counting. The leukocytes were first analyzed by Abbott Labs Cell-Dyn 3500R hematology analyzer using a porcine program for determining the relative distribution of neutrophils, lymphocytes, monocyte/macrophages, eosinophils, and basophils. An aliquot was then frozen in TRI-Reagent (Molecular Research Center, Cincinnati, OH) in liquid nitrogen and later transferred to a −70°C freezer for eventual preparation of total RNA. The plasma fraction of blood was defibrinated using CaCl2 and stored at −20°C for the determination of IgG, IgM, and IgA concentrations and the IgG, IgM, and IgA responses to FL, TNP, and colonizing bacteria. Serum IgM, IgA, and IgG levels were determined by sandwich ELISA as described previously (6, 27, 29). Specific Ab responses to TNP and FL were determined by specific Ab immunoassay (SpAbI) using FL-swine albumin or TNP-swine albumin as the solid phase Ag and following the principles previously described for SpAbI (35, 36). All titrations were analyzed using the ELISANALYSIS program (37), and data are expressed as ELISA units per milliliter using the serum from a hyperimmunized swine as a reference standard. ELISA-based Ab activity was converted to specific activity using the following formula: ELISA units of activity/ml ÷ Ig concentration (μg/ml) × 100, where Ig is the isotype measured by sandwich ELISA (62) and in the SpAbI used to measure ELISA units of activity (Figs. 3⇓ and 4⇓). 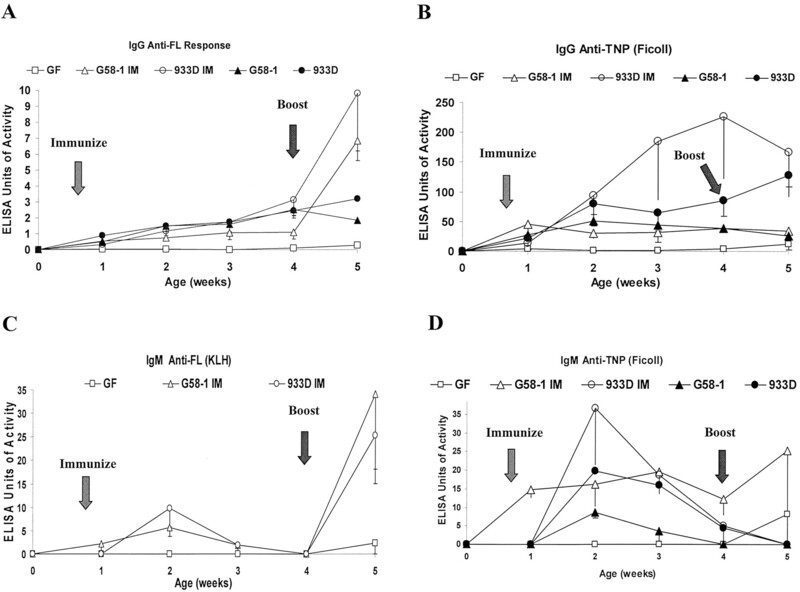 The serum Ab response to a thymus-dependent Ag (IgG and IgM anti-FL-KLH; A and C) and the IgG and IgM responses to a type 2 thymus-independent Ag (TNP-Ficoll; B and D). The arrows indicate the times of immunization and boost. Data are expressed as the mean and SE. The treatment groups are the same as those described in Fig. 2⇑. The specific activity of the serum IgG and IgM responses to a thymus-dependent Ag (FL-KLH; top and center) and a type 2 thymus-independent Ag (TNP-Ficoll; bottom). Anti-Fl specific activity is presented in two scales (top and center), since the magnitude of change in secondary responses (top) hides differences among groups before boost. Dotted line, IgM; solid line, IgG. Variations among animals in treatment groups are of the same magnitude as for Ig levels (Fig. 2⇑) and are presented without error bars to reduce clutter. Differences between treatment groups from the same litter are not significant at the 0.05 level using Student’s t test. Any apparent difference in IgM anti-TNP specific activity is not statistically significant because of animal variation among piglets (see Fig. 3⇑D). The serum Ab activity to colonizing and unrelated control bacteria was determined by SpAbI in the manner previously described in which bacteria at 109/ml were sonicated in methyl glyoxal (Sigma-Aldrich) and adsorbed on microtiter plates (38, 39). Data are presented as ELISA units per milliliter using the serum from a conventional adult swine as a reference standard. Tissues collected at euthanasia (Fig. 1⇑) were frozen in OCT (TiterTek, Miles, Elkhark, IN) in methyl pentane over a bath of liquid nitrogen. The frozen tissues were then stored at −20°C. Tissue blocks were sectioned into 6-μm sections using a cryotome and recovered on SuperFrost slides (Fisher Scientific, Pittsburgh, PA). The tissue sections were dried and then fixed for 10 min in acetone. Sections were surrounded with a wax dam (PAP pen; Research Products International, Mount Prospect, IL) and then hydrated by placing them into a shaking bath of PBS for 20 min. The hydrated sections were then incubated for 20 min with two or three changes of a blocking solution (PBS containing 0.1% Tween 20 and 1% BSA). Sections were then incubated with optimal dilutions of mAbs specific for porcine IgG (no. 136; Aventis Pasteur, Lyon, France), IgA (1456; Klaus Nielsen, Nepean, Ontario, Canada) and IgM (5C9B12; P. Paul, Iowa State University, Ames, IA). A mAb to fluorescein (9-40; E. Voss, University of Illinois, Chicago, IL) was used as a negative control. Ig localization was visualized by the addition of peroxidase-conjugated goat anti-mouse IgG (A-2554; Sigma-Aldrich), followed by the addition of 3-amino-9-ethyl-carbazol (A-5754; Sigma-Aldrich). Endogenous peroxidase activity was extinguished by incubation with 0.1% peroxide for 15 min before the blocking step and before addition of the primary mAb. Sections were then counterstained with either Mayer’s hematoxylin or methyl green (M-295; Fisher Scientific). In data reported here, the number of follicles in the ileal Peyer’s patch (IPP) region that were heavily stained positively for IgM, IgA, and IgG were recorded for up to 300 follicles/piglet. Consistent with our previous report (6), there was no increase in serum Ig levels in piglets maintained GF (Fig. 2⇑). Colonization resulted in a progressive increase in serum Ig levels in both immunized and nonimmunized animals, but the effect of colonization was not generic. Colonization with E. coli 933D resulted in a >4-fold increase in IgG (Fig. 2⇑, A and B) and a >3-fold increase in IgM (Fig. 2⇑D) compared with colonization with the benign commensal G58-1. Fig. 2⇑A gives data for individual piglets showing that within-group animal variation is minimal, whereas differences between groups are large. Because of the tightness of intragroup values, all subsequent studies were restricted to four to eight animals per group (Fig. 2⇑, B–D). Data show that serum IgM (Fig. 2⇑D) and IgG (Fig. 2⇑B) levels peaked 2 and 5 wk after colonization, respectively. IgA levels increased in all colonized piglets and remained constant after wk 3, but did not differ among groups. In data not shown, the blood leukocytes of GF piglets were comprised of 62% lymphocytes, 28% neutrophils, and 5% nonlymphoid monocytes. This pattern differed remarkably from colonized piglets in which 60–80% of blood leukocytes were neutrophils, 8–25% were lymphocytes, and 6–8% were monocytes. Neutrophil levels were highest in animals colonized with 933D. Fig. 3⇑, A and B, show that all piglets colonized with E. coli G58-1 or 933D had serum IgG Abs to FL and TNP, whereas GF piglets did not. Anti-FI and anti-TNP activities were highest in piglets colonized with 933D, especially in those that had been immunized. A slight elevation of the mean IgG and IgM responses at wk 5 in GF animals was consistently seen and was due to a single animal that apparently encountered bacteria (Fig. 6⇓). Since piglets in initial studies received only 3 mg of each Ag, we administered 19 mg of TNP-Ficoll plus 19 mg of FL-KLH to several GF isolator piglets. In data not shown, these animals behaved exactly as GF animals that received 6-fold less TNP-Ficoll and FL-KLH (Fig. 3⇑). Responses to the TD Ag (Fig. 3⇑, A and C) showed minimal within-group variation, whereas both IgG (Fig. 3⇑B) and IgM (Fig. 3⇑D) responses to the TI-2 Ag in immunized piglets varied considerably in piglets colonized with 933D. This variation compromised efforts to determine whether immunized piglets really differed from controls that had only been colonized; because of this variation, they did not differ statistically. Also noteworthy is that no IgM anti-Fl activity was detected in colonized-only piglets (Fig. 3⇑C). 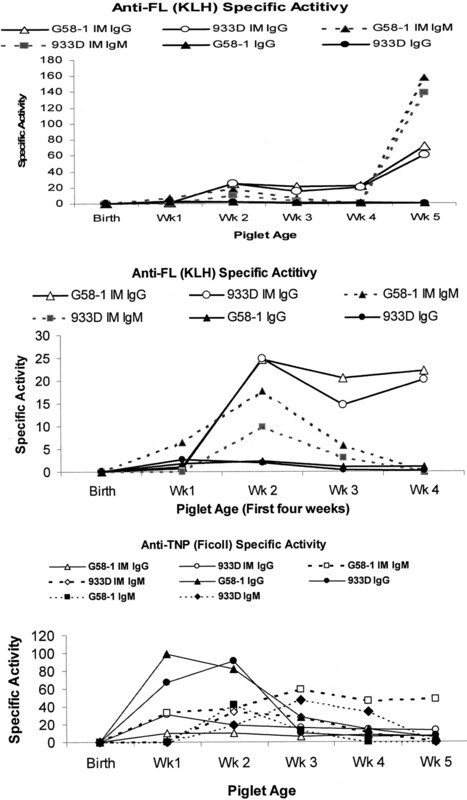 Colonized piglets that received FL-KLH on day 3 showed a modest primary IgM response by day 10, which declined thereafter, but showed a pronounced rise in ELISA activity (Fig. 3⇑C) and specific activity (Fig. 4⇑, top) 1 wk after booster immunization. A similar increase was seen for IgG anti-FL, but without any peak in ELISA activity (Fig. 3⇑A) or in specific activity (Fig. 4⇑, top) at wk 2. In contrast, there was no statistically significant increase in IgG or IgM anti-TNP Ab (Fig. 3⇑, B and D) or specific activity (Fig. 4⇑, bottom) following booster immunization at wk 4 with the TI-2 Ag TNP-Ficoll. As indicated above, serum IgA anti-FL or anti-TNP Ab were not detected. Immunization of colonized isolator piglets with TNP-KLH (TD Ag) and FL-Ficoll (TI-2 Ag) was undertaken to test whether the differential character of the response to FL-KLH and TNP-Ficoll was hapten dependent. The data presented in Fig. 5⇓ show that the IgG response to TNP (especially 933D-colonized piglets) resembles that of the IgG and IgM response to FL in Fig. 3⇑, in that a secondary response is seen (Fig. 3⇑, A and C). However, only 933D-colonized piglets gave a pronounced IgM response, and no secondary IgM response was seen in either group (Fig. 5⇓, bottom). Piglets immunized with FL-Ficoll had only IgG responses and, similar to those receiving TNP-Ficoll (Fig. 3⇑, B and D), had no secondary responses. Consistent with the data in Fig. 4⇑, we observed no difference in specific activity of the anti-TNP and anti-FL responses between G58-1- and 933D-colonized piglets (data not shown). Serum response to TNP expressed on a thymus-dependent carrier (KLH) and to FL expressed on the TI-2 carrier Ficoll. Top, IgG anti-TNP-KLH; center, IgG anti-FL-Ficoll; bottom, IgM anti-TNP-KLH. Vertical arrow indicates the time of boost. GF animals in this study failed to develop Abs to TNP and FL of any isotype. Fig. 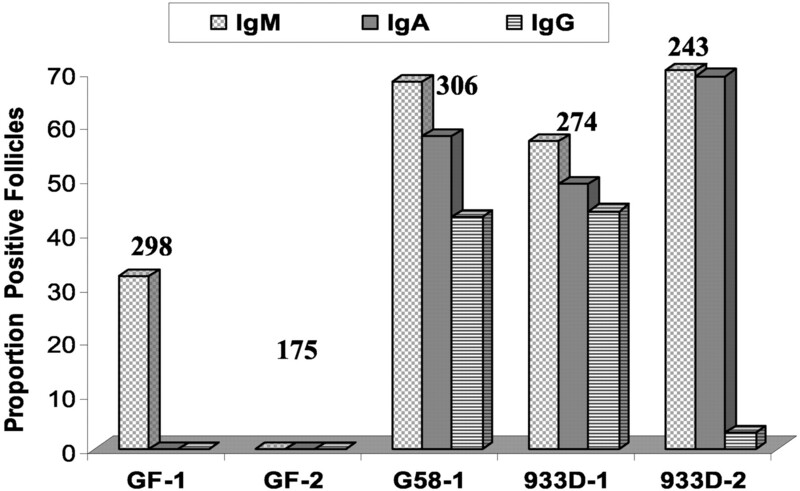 4⇑ (top and center) shows that the pre-boost specific activities of IgG and IgM Abs to FL did not differ between immunized piglets colonized with G58-1 or 933D. Similarly, IgG specific activities to TNP in animals colonized with the same bacteria, regardless of immunization, did not differ (Fig. 4⇑, bottom). Considering the large variation in the IgM anti-TNP response (see Fig. 3⇑D), differences in the specific activities of IgM anti-TNP responses between G58-1- and 933D-colonized piglets, regardless of immunization, could not be distinguished (Fig. 4⇑, bottom).Comparing these results to the ELISA activity shown in Fig. 3⇑ indicates that the strain of colonizing E. coli influences the amount of anti-TNP and anti-FL secreted, but does not affect the proportion that is Ag specific before the boost. However, the specific activity of both IgG and IgM Abs to the TD Ag FL-KLH increased during the secondary immune response in animals colonized with either E. coli strain, suggesting an Ag-driven event4 that is Ag, but not E. coli strain, dependent. An interesting observation was the E. coli strain-independent, higher IgG anti-TNP specific activity at wk 1 and 2 in nonimmunized piglets vs those immunized with TNP-Ficoll (Fig. 4⇑, bottom). Piglets in these groups were from different litters. Since IgG levels are very low at this time (Fig. 2⇑B), small differences in the proportions of genetically determined natural IgG Abs to TNP might explain this finding. Fig. 6⇓ shows that serum IgG Abs distinguish between the colonizing and noncolonizing E. coli strains only in 933D-colonized piglets and, based on specific activity, appear Ag-driven only in piglets colonized with the EHEC. 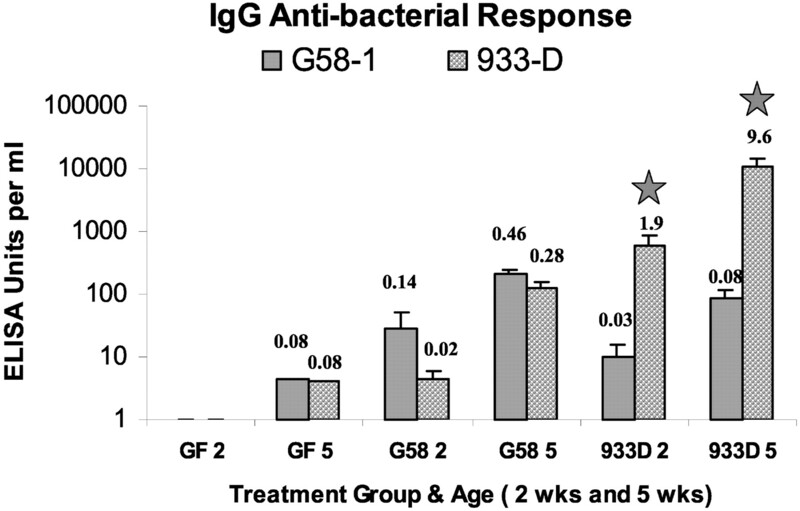 While IgG antibacterial activity after 5 wk is 20-fold higher in G58-1-colonized animals than GF controls, no significant increase in specific activity was observed. The same was true for the Ab response to G58-1 in animals colonized with 933D. The anti-bacterial response in GF piglets at wk 5 is due to the same GF piglet that shows trace responses to FL and TNP (see Fig. 3⇑). 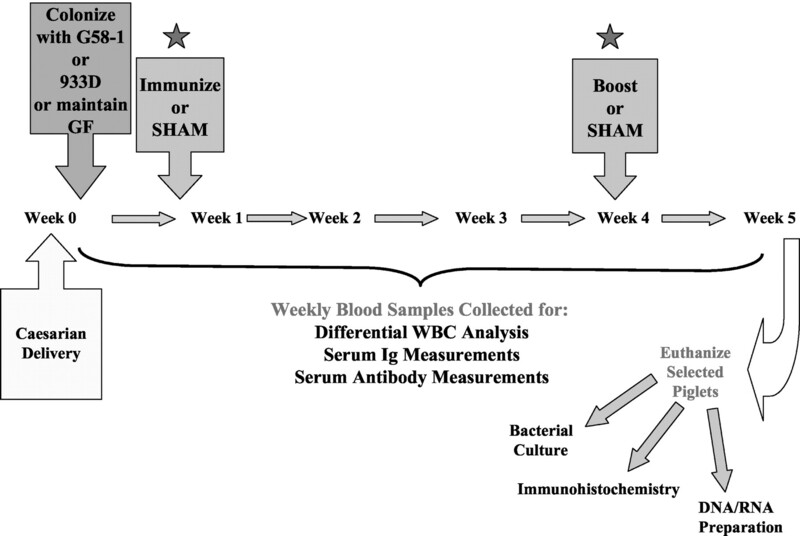 The serum IgG antibacterial response of immunized isolator piglets. The Ab activity to the colonizing E. coli at wk 2 and 5 (indicated as GF2, GF5, G58-2, etc.) are expressed as ELISA units per milliliter. The value above the bar indicates the specific activity of the IgG response to each bacteria. ∗, Values for specific activity that were statistically different among groups and bacteria. In a previous study we demonstrated that colonization with commensal flora preferentially caused diversification of the Ab repertoire associated with the mucosa (6). Since in this study colonization with 933D had a pronounced effect on serum IgG Ab responses especially to the colonizing bacteria, we investigated the histology of the IPP. When we examined the IPP of GF piglets after 5 wk, <30% of the follicles contained B cells that were heavily surface stained (Fig. 7⇓), and these were exclusively IgM+ (Fig. 7⇓, GF-1). GF-2 contained no heavily stained follicles. In contrast, colonized piglets had mixtures of follicular B cells that were surface positive for IgM, IgA, and IgG in the same follicles, although the frequency of IgM- and IgA-containing follicles generally exceeded the number of follicles that also stained for IgG (Fig. 7⇓). In data not shown the extensive staining of the intestinal crypts in colonized piglets was almost exclusively detected using anti-IgA. Either by enumerating the number of follicles (Fig. 7⇓) or by visual inspection of crypt staining (data not shown), no differences between G58-1- and 933D-colonized piglets were observed. The proportion of IPP follicles that were stained for IgM, IgA, and IgG in individual GF and colonized piglets. The colonizing E. coli strain is indicated. The numbers above the histogram for each animal indicate the number of follicles examined in each animal. The data presented indicate that bacterial colonization of the gut is the adjuvant that permits newborn piglets to secrete Abs in serum to both TD and TI-2 Ags regardless of whether they were immunized with these Ags (Figs. 3⇑ and 5⇑). Since colonization alone raises Ig levels and ELISA activity to FI and TNP (Fig. 3⇑), but specific activity does not differ between 933D- and G58-1-colonized piglets before boost (Fig. 4⇑), colonization appears to have a mitogenic effect on B cell differentiation and secretion of natural Abs. We also show that Ag-driven responses (1) are only seen against pathogenic E. coli or following secondary exposure to i.p. administered TD Ags. These generalizations fit best to IgG responses, since no IgM anti-FL activity was detected in piglets that were only colonized. The use of TNP-Ficoll as a TI-2 Ag has been validated in mice (21) and rats (40). In mice, TI-2 immunogens activate mature B cells and may even inactivate naive B cell (20, 41, 42). Since we show that colonization is also required for responses to the TI-2 Ag TNP-Ficoll in newborn piglets, it suggests that the B cells of these animals are naive and cannot respond to simple receptor cross-linking, but require costimulation by some factor that is unavailable before encounter with bacteria. A similar observation has been made in studies of neonatal mouse B cells in vitro (43). Assuming that B cells in newborn piglets are naive (reagents are currently unavailable to determine this), the second signal they require could be provided by costimulation from the macrophage/dendritic cell lineage or by direct action of bacterial products on B cells. Bacterial DNA can directly affect B cells (24), and E. coli LPS is a well-known B cell mitogen (20) that binds TLR-4 on B and other cells and CD14 on macrophages (18, 19). LPS can also promote class switch, especially if other cytokines are provided (44, 45, 46). Bacterial DNA also stimulates dendritic cells (47), and stimulation of plasmoid-type dendritic cells by bacterial DNA is via binding to TLR-9 (48). LPS and peptidoglycans also stimulate this cell lineage (14, 16, 17, 18, 19). If the second signal that allows piglet B cells to proliferate and differentiate in response to TI-2 Ags comes from a macrophage or dendritic cell, the phenomenon would be consistent with the view that macrophages require bacteria or bacterial products for their stimulation and for expression of costimulatory molecules (49). Since macrophage numbers and activity are low in GF animals (50, 51), unresponsiveness to TI-2 Ags may result from insufficient levels of macrophage-derived IL-1 (52). In studies reported here, colonized piglets had a marked increase in the proportion of neutrophils that could be ascribed to chemotaxins released by macrophages activated by products from colonizing bacteria. A third avenue for B cell costimulation in colonized piglets may be T cells, since there is evidence that responses to TI-2 Ags require some Th cells or T cell cytokines (23, 53, 54, 55). A T cell effect would not be surprising, since colonization induces a sharp increase in α/β Th cells in the gut (56) without affecting γ/δ T cell levels (57). However, our failure to see an increase in IgG or IgM anti-TNP following booster immunization at wk 4 (Figs. 3⇑ and 4⇑), while such a rise in anti-FL was seen after secondary exposure to FL-KLH, suggests that this TI-2 Ag does not prime the piglet system for an anamnestic response. A similar absence of secondary response was seen when FL was administered as FL-Ficoll (Fig. 5⇑). These findings are consistent with studies in which responses to TI-2 immunogens do not 1) obtain T cell help, 2) initiate germinal center formation, and 3) stimulate memory B cell formation (58). Pigs experimentally inoculated with O157:H7 enterohemorrhagic E. coli develop mild to marked edema in the mesentery of the spiral colon. EHECs of this group are known to be invasive (59), and intimate attachment of the bacteria to intestinal epithelial cells eventually leads to their death and necrosis. Infection with EHEC is accompanied by inflammation, which includes neutrophila of the intestinal crypts and the lamina propria. E. coli strain G58-1 does not cause edema or attach to the intestinal epithelium. Epithelial cells remain normal, and inflammation of intestinal tissues is not apparent (31). Since E. coli G58-1 presumably poses no threat to the young piglet, our data suggest that the immunological effect of colonization per se with this E. coli appears not as a response to “danger” (60), but is merely a mitogenic response to the chemistry of bacteria (49). However, above this generic effect, pathogenic 933D may be viewed as a danger to the newborn, since there is a significant increase in the specific activity of the serum IgG antibacterial response to enterohemorrhagic E. coli (Fig. 6⇑). We have previously shown that normal, nontranslocated gut flora cause preferential diversification of the mucosal IgA response (6), which may be T independent (61). This local response may keep commensal bacteria confined to the gut lumen, whereas invasive and translocating pathogens stimulate systemic IgG Abs that, in turn, attempt to prevent the systemic spread of the pathogens. We show here (Fig. 7⇑) that there is no apparent difference between G58-1- and 933D-colonized piglets with regard to B cell diversification in the IPP or intestinal crypts (data not shown) or in their effect on serum IgA levels (Fig. 2⇑). Thus, the preferential increases in serum IgG and serum IgG Ab activity, and the 5- to 20-fold increase in its specific activity in 933D-colonized piglets may reflect partial translocation5 of 933D or some danger signal it stimulates by its presence in the gut. It has been shown that the parent strain of 933D does translocate across the intestinal wall in mice (59). While colonization stimulates local developmental events, translocating pathogens release Ags in the peritoneum causing Ag-driven4 systemic effects such as the secondary response to TD Ags administered i.p. (Fig. 4⇑). The increase in IgG Abs that bind both 933D and G58-1 in animals colonized with G58-1 suggest a mitogenic effect on B cells that express a germline-encoded repertoire that recognize may ubiquitous environmental Ags. This is suggested by the absence of an increase in specific activity in G58-1 animals and is supported by unpublished data showing that these Abs strongly recognize Vibrio fischerei (a commensal in the eye of marine fish) and Methanobacterium thermoautotrophium. Presumably, the appearance of anti-Fl ant TNP in piglets never exposed to FL-KLH or TNP-Ficoll results from the same mitogenic effect (Fig. 3⇑). These early pre-boost IgG Abs may be important for piglets and may be analogous to the natural IgM Abs in mice (62). A weaker correlation with a natural IgM response was observed, especially since no IgM response to Fl was seen in nonimmunized piglets (Fig. 3⇑C). In any case, the immediate availability of natural Abs, without the delay associated with Ag-driven germinal center formation, could allow the piglets to quickly respond to environmental challenges, including the release of numerous Ab specificities such as those to Fl and TNP that they never encountered. Since switch recombination in the fetal piglet is an Ag-independent event (27), the use of natural IgG Abs seems consistent with the overall precosial nature of piglets compared with the altricial offspring of rodents and humans (27, 63). Our observation that colonization stimulates the appearance of serum Abs to TNP and Fl in both immunized and nonimmunized piglets may also have significance for autoimmunity and graft-vs-host (GVH) disease since GF mice do not experience GVH disease (64) or autoimmunity (65, 66). Failure of GVH in GF animals has been ascribed to the absence of bacterial Ags that are cross-reactive with human tissues. However, it could also be due to the inability of naive macrophages/dendritic cells and B cells to respond to Ags before bacterial exposure. The data we have presented on the IPP of GF and colonized piglets draws attention to the role of the IPP in artiodactyls. In swine and ruminants such as sheep and cattle, Peyer’s patches occur either as isolated patches along the jejunum and upper ileum (jejunal Peyer’s patches) or as a continuous array at the terminal end of the ileum, i.e., IPP (67, 68). In sheep these are considered by some as a type of bursal equivalent that are involved in Ab repertoire development for the whole organism (69). This observation has lead to the oversimplified concept that homeothermic vertebrates could be grouped into those that used hindgut lymphoid tissue for development of their Ab repertoire (chicken, rabbit, artiodactyls) vs primates and rodents that used the fetal liver and bone marrow (70). At least for swine this concept appears flawed, since studies to date suggest that the swine IPP is most notably part of the mucosal immune system of the gut (Refs. 6, 29 , and 71 and this report). IPP follicles in GF piglets resemble primary lymph node follicles with near exclusive expression of IgM+, whereas the proportion of IgA- and IgG-containing follicles in colonized piglets is 3- to 40-fold greater (Fig. 7⇑). This increase in activity of the IPP in colonized animals is in agreement with data reported by Pabst et al. (67) on the IPP of piglets and IPP in sheep (72) and with data on jejunal PP in rats (73). In colonized piglets, these follicles contain mixtures of B cells of all three isotypes (Fig. 7⇑) resembling lymph node germinal centers. Since IgM and IgA cells predominate in such follicles while the nearby crypts contain >90% IgA+ cells (data not shown), the porcine IPP appears to behave like a jejunal Peyer’s patch, a legitimate part of the mucosal immune system and not a mammalian bursal equivalent. Alternatively, swine IPP may serve a dual function. Initially they may serve as a site of B cell diversification as reported for the chicken bursa or rabbit appendix (72, 74) and then later transition to function as part of the mucosal immune system (75). Although the data presented here come from a small number of outbred animals, the large differences seen between treatment groups are statistically significant and demonstrate that environmental influences are more important than genetic variation in effecting immunological development when measured by the parameters selected for this study. Our data indicate that colonization of the newborn gastrointestinal tract, at least in the piglet model, plays a major role in development of both the systemic and mucosal immune systems of the neonate. The relative effect on these two branches of the immune system may depend on whether the colonizer is a benign commensal or a pathogen. Perhaps most revealing is the role played by colonization in allowing the neonatal immune system to secrete Abs to nonbacterial TD and TI-2 Ag even when not immunized with these Ags. Thus, we propose that colonization, even with a benign commensal, has a key adjuvant effect that allows naive B cells to differentiate into plasma cells and/or for APCs to express costimulatory molecules that, in turn, stimulate B and Th cells. Thus, pattern recognition of bacteria may stimulate the secretion of natural Abs that constitute part of the neonate’s initial defense to pathogens. We thank Marcia Reeve, Department of Microbiology, for preparation of the typescript. ↵1 This work was supported by U.S. Department of Agriculture-National Research Initiative Award 99-35204-8469, Award 99-023 from the National Pork Producers Council, and an award from The Carver Trust, University of Iowa. ↵3 Abbreviations used in this paper: TD, T-dependent; BCR, B cell receptor; FL-KLH, fluorescein-labeled keyhole limpet hemocyanin; GF, germfree; GVH, graft-vs-host; IPP, ileal Peyer’s patch; SpAbI, specific Ab immunoassay; TI-2, type 2 T-independent Ags; TLR, Toll-like receptor; TNP, trinitrophenylated. 4 Ag-driven responses are defined as an increase in specific activity, whereas an increase in Ab titer without an increase in specific activity suggests mere differentiation and proliferation of cells in the B cell lineage without selection, i.e., the equivalent of mitogenic stimulation. ↵5 Translocation of 933D is currently under investigation. Cebra, J. J., H.-Q. Jiang, J. Sterzl, H. Tlaskalova-Hogenova. 1998. The role of mucosal microbiota in the development and maintenance of the mucosal immune system. P. O. Ogra, and J. Mestecky, and M. E. Iamm, and W. Strober, and J. R. McGhee, and J. Bienenstock, eds. In Mucosal Immunology, Chapt. 17 267-280. Academic Press, New York. Drasar, B. S., P. A. Barrow. 1985. Aspects of Microbiology, Vol. 10: Intestinal microbiology Van Nostrand Reinhold, Wokingham, U.K.
Takada, H., S. Kotani. 1985. Immunopharmacological activities of synthetic muramyl-peptides. D. E. S. Stewart-Tull, Jr, and M. Davis, Jr, eds. Immunology of the Bacterial Cell Envelope 119-152. John Wiley & Sons, Chichester, U.K.
Butler, J. E.. 1974. Immunoglobulins of the mammary secretions. B. L. Larson, Jr, and V. Smith, Jr, eds. Lactation: A Comprehensive Treatise, Vol. III, Chapt. 5 217-255. Academic Press, New York. Butler, J. E.. 1998. Immunoglobulins and immune cells in animal milks. P. L. Ogra, Jr, and J. Mestecky, Jr, and M. E. Lamm, Jr, and W. Strober, Jr, and J. R. McGhee, Jr, and J. Bienenstock, Jr, eds. Mucosal Immunology, Chapt. 98 1531-1554. Academic Press, New York. Butler, J. E.. 1994. Enzyme-linked immunosorbent assay. C. J. Van Oss, Jr, and M. H. V. Regenmortel, Jr, eds. Immunochemistry, Chapt. 29. 759-803. Marcel Dekker, New York. Butler, J. E., R. G. Hamilton. 1991. Quantitation of specific antibodies: methods of expression, standards, solid-phase considerations and specific applications. J. E. Butler, Jr, ed. Immunochemistry of Solid-Phase Immunoassay, Chapt. 9 173-198. CRC Press, Boca Raton. Peterman, J.. 1991. Immunochemical considerations in the analyses of data from non-competitive solid-phase immunoassay. J. E. Butler, Jr, ed. Immunochemistry of Solid-Phase Immunoassay 47-66. CRC Press, Boca Raton. Janeway, C. A., Jr, P. Travers, M. Walport, J. D. Capra. 1999. Immunobiology Garland, New York. Uhr, G.. 1993. Vergleichende Untersuchungen am Darmtrakt des Wild-und Hauschweines unter besonderer Berücksichtigung des Darmschleimhaut-immunosystem Habilitationsschrift Tieärztlichen Hochschule, Hannover.